This past week has been a refreshing reminder of everything I love about rugby. On my way back to Japan, I stopped off in Perth to help Robbie Deans coach a World XV invitational side to play against the Western Force in a Rapid Rugby exhibition match. The team is drawn from players all over the world and guys from different backgrounds, some who speak different languages, have had to come together quickly. In essence, everything you spend a preseason trying to get installed with a provincial side we’ve had to try and do in a handful of sessions. It’s really reminded me why I started coaching all the way back in 1982 because the one thing that all these players have in common is they want to enjoy their rugby. There are a few former All Blacks and then other youngsters who are just coming through the ranks. So we’ve got some guys who have never played Super Rugby training with Andy Ellis, Corey Flynn and Wyatt Crockett. The thing that has bonded them instantly is that they all love rugby, and they all love what rugby is about – the camaraderie, getting back up when you’re knocked down, and digging deep to motivate your teammates even though they’ve only been training together for a few days. That’s what rugby is all about, and it’s something the sport has got to hang onto. Looking at the announcement that the Sunwolves will be axed from Super Rugby in 2021 got me thinking that maybe the decision-makers have come to the realisation that the product we had is the one we want to keep. Japan loves rugby and that’s why they wanted a bigger stage to raise the profile of the sport there through Super Rugby. A team in Asia in a conference system might have sounded like a good idea at the time but, as we’ve seen, it hasn’t really worked. The main reason administrators took rugby down that road was because they thought there was money to be made. Rugby was chasing a foothold in the Asian market and now, six months before the first Rugby World Cup in Asia, we’ve got the announced termination of the only Super Rugby side on the continent. Because of the size of the potential market, rugby has been clamouring to get into Asia to sell jerseys and memorabilia, just like Toulon tried to do by signing Japan fullback Ayumu Goromaru a few years ago. But what the Sunwolves model has show is that it doesn’t work like that. The Japanese need to develop their own regional rugby market and produce more home-grown heroes before trying to step up to Super Rugby. As I said in my last column, reaching bigger markets is the driving force behind World Rugby’s eagerness to launch a global league. 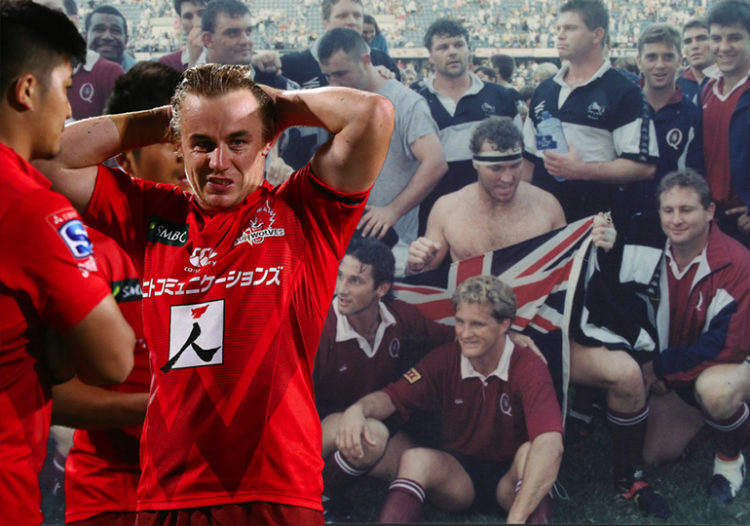 The Sunwolves’ fate should raise a big, red flag. It’s not as simple as just chasing money, because the chase changes the product. If they go ahead with the global league, rugby will end up with a soccer model where players earn most of their money playing club rugby for private owners all over the world at the expense of the integrity, intensity and mystique of Test rugby. Some people say that will never happen, but that’s what they said in the mid-90s when concerns were raised about Super Rugby eating away provincial rugby. Super Rugby started with the best provincial teams playing each other – it was Transvaal versus Otago, and Natal versus Queensland – and then they introduced franchises. These days a Super Rugby contract is more important than a provincial contract, and Super Rugby is far more important than the Currie Cup. Where does it end if rugby keeps getting bigger and bigger? And are we happy with a future where Test matches become more of an exhibition than a do-or-die battle for national pride? Is the money and the market more important than the product? As a die-hard, old-school guy, I fear that we’re going to lose what this great game is all about. It’s a sport that uniquely includes players of all shapes and sizes, and a game that has clear values on and off the field. It’s encouraging that Sanzaar has seen that the current model isn’t working and they’ve had the guts to reverse the changes to bring a round robin format back to Super Rugby. Who’s to say we don’t end up going all the way back to the best provincial teams qualifying for Super Rugby? That model certainly worked for the quality of the product. I totally agree with you, I have always said, we need to make the Currie Cup beginning of the year giving all our teams a opportunity to get into SuperRugby for the season, the top 4 goes through to play SuperRugby which should be hosted during the second half of the year. Bring back more 3pm kick off games to allow more families to go to games by this you create more long term interest and investment in the youths, instead of drunks which are catered for with the 5pm and 7pm kickoff. Play Currie Cup games in out laying Cities or town to enable people from all o er to enjoy the games who can’t always get to a big city game. You basically said everything that I was going to say. I agree 100%! It was all going well till you called me a drunk! It just emphasizes the fact that SANZAAR made the initial call to include Japan on the basis of financial benefit and not that of rugby! I am also of the view that they need to cut one of the New Zealand sides as well. There is simply not enough talent to justify five Super Rugby teams in New Zealand. They currently enjoy five fifteenths of the pot, without real justification! Whilst SAZAAR have now effectively admitted that the inclusion of Japan in Super Rugby was not a great idea, I would then ask why it is seen by many as a great idea to include them in our Pool for the proposed World rugby league? Agreed. The Blues are only there on reputation. Australia can cut a team too and we go back to good old Super 12. If they really want, why not create a Tier 2 competition. This includes the Sunwolves, USA, Pacific Islands with the Force, Reds, Blues and well, opportunity lost to include the Kings and Cheetahs. Although the Cheetahs and Kings really don’t belong in Pro 14, they making up the numbers there. I’m sure there’s a few provincial teams out of NZ and SA who could partake also ie. Pumas and Tasman (who are not part of a Super Rugby franchise region). Yes good idea Dean. This would also be a lot fairer on the travel burden, with a more balanced split! Yeah, the World Rugby League pools are a joke! They’ve basically looked at the 6 Nations and thought “What can we add to this?” The result is the NH teams have a their nice little tourney as per usual and the SH teams (including Japan and the US) having to travel halfway around the world on a weekly basis). It’s stupid!! Ja Sharky, no real feedback from the meeting they had on this. Would love to have beern a fly on the wall. The thing that really got me going was the very remote whisper, that many would probably have overlooked, indicating that the Six Nations competition would survive the New structure, whilst the Southern Hemisphere Rugby Championship would fall away! Sweets – rumour has it The Stormers management have requested Egon Seconds refs the Blues game. Other than that we have the scary prospect of SP Marais marking Rieko Loane. Other bad news is De Allende is fit to play. One would think he would have the common decency to fake an injury. John, Good one on D’Allendig, easily the most overrated player of all time yet much loved by Rassie for some unknown reason apart from him being a Stormpie of course. Cheers. Stormers must surely take this one at a doddle! Stormers are going to lose by 20+. Ioane will score 3 try’s on his own against the slugs in the Stormers backline. It’s really their best opportunity to get a victory in NZ! They are playing backline players out of position! SP should be at 15, it’s his natural spot and he covers it pretty well. Leiyd at wing. Play should be off 10 and not burden a rookie 9. Stander was very capable at 10 during Currie Cup, why is he not given game time? Remgro’s press officer, Rob Houwing baying for Willemse at 10. Does he not remember the game against the Chiefs last year? Barry that backline is pretty poor overall. Jantjies now known for his sniping tries will be more closely watched by the opposition going forward but pretty average otherwise. DuPlessis at flyhalf is a disaster at the moment, D’Allendig is pathetic and Dan workmanlike at best. The wings are never used and Lleyds is unpredictable. Willemse is totally overrated and how he became a Bok only Rassie knows. I think this Stormers team with clueless Fleck in charge are on a hiding to nothing notwithstanding their ‘Bok’ pack who still have to impress as a unit. If it wasn’t for Seconds they would have been in even deeper trouble at this stage. And now for the bad news, lol. Cheers. Good article Jake most of which I totally agree with. Your sentiments hark back to the good old days when a player was unpaid and played for his country and nothing else. When long tours were the order of the day and Provinces played the touring teams. There was no need for posing bodies on TV adverts with players glaring at the camera and displaying their physiques and on match day continuously checking the big screen to confirm their hairdo’s are still in place. Those were the days when the Currie Cup produced real champions a Spur Burger cost 50 cents and the lights never went out. Yes, those were the days my friend, we thought they’d never end – regrettably they did. If you remove the ‘soul’ of the game and you replace it with the ruthless pursuit of money you get what we have today a game that is a pale shadow of it’s former self. Progress ?? Yeah right. Cheers. Jake. You hit the nail on the head. It’s not about the money it’s all about the love of the sport. It’s the pride of playing. The club rugby games in the late 80’s was all about trying your heart out for the honor of wearing the provincial Jersey. Then the National Jersey. It was all about the friendships that were made on the field. Even with your opposing number. Well said Sir.